Located in north central North Dakota, we are celebrating 100 years of this family owned farm/ranch. I don't participate in the Saturday Photo Hunt very often but happened to have an entry for this week's topic. Hubby & I were recently in Prague, Czech Republic. 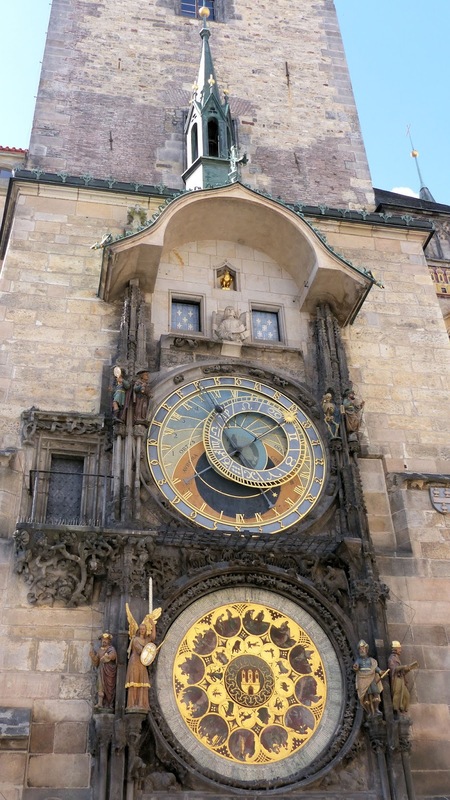 While there we saw the Astronomical Clock. What an amazing piece of work.
" Prayer isn't just spoken words. Sometimes it is done walking, as we take a stroll through our neighborhood and say prayers over our neighbors and the surrounding schools and organizations. Other times, it is with our hands, as we touch every piece of fabric and thread while constructing a quilt. What does prayer look like for you? " Some folks have replied that prayer looks like knitting or quilting or with kits put together to help those who are struggling. Well, for me - tonight especially - prayer looks like a 'gazillion' stars and northern lights along with the scent of a bit of rain. It is the grass that just perked up from that rain, the fresh little calf with its proud mommy, or the happy dog running along side the four wheeler with me. See, I had never thought about prayer looking like anything. It was quite simply a quiet time to visit with our Lord to share my thanks and concerns. I did not think about it being prayer when I stopped 'to smell the roses'. You know, enjoy the smell of the rain or the freshly turned soil. OR, taking time to observe the birds on the water or the beaver swimming in the dam. That was just appreciating nature, well, know I will think of it as prayer. We are about 1/3 done with calving. We run just over 300 females, so have about 100 calves running around. We have had 3 sets of twins. They add extra work because we need to make sure both calves are getting to eat enough, make sure the cow has enough milk for both calves, and that she loves both calves. The first set are still together with their mom. 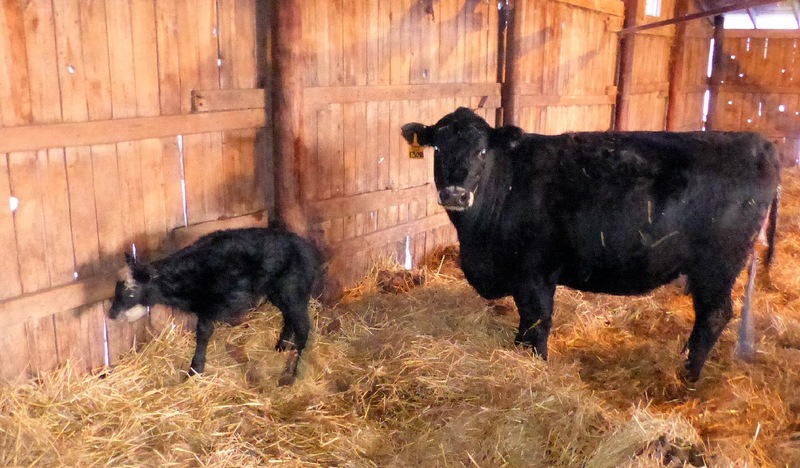 The second set was born to a heifer (first calving). It is hard on the cow feeding two calves so Brett fed them some milk replacer to supplement the cow's milk. We then had a cow who's calf died so we moved one of these twins onto that cow. Lucky for everyone, that foster project was successful. Just a couple of days ago, Christopher took a cow to the veterinarian as she was having trouble calving. It turned out that her calf was breech. The vet got it turned around and delivered - only to find a second calf in there!! Thus, our third set of twins. This set is unusual as one is black with white face and the other is red with a white face. This cow is a black white face (happens to be Black Angus / Hereford cross). She was bred by an Akaushi bull. This breed has both the black and the red trait. So, obviously, this is how one cow had calves of each color. They are all doing fine. 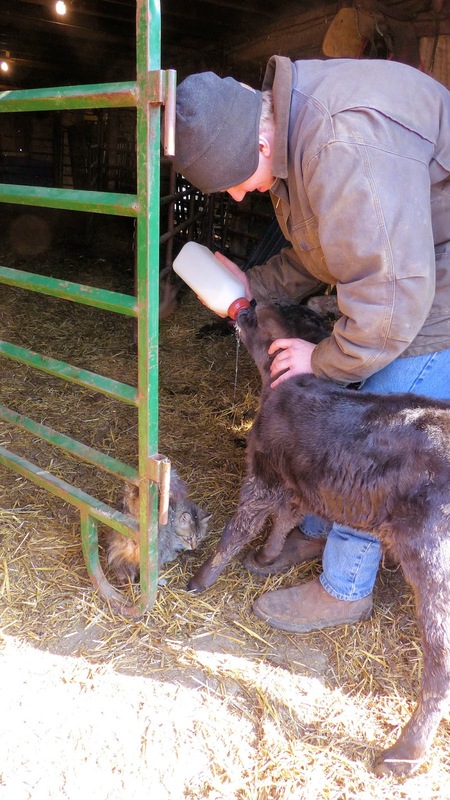 Just when Brett thought he might be done bottle feeding, he found an orphan calf. We cannot find who the mom is. The guys walked around the herd with no luck. We finally decided it must be a twin and the cow just walked away from it with her other calf. However, when you have 5-10 calves born in one day it is difficult to figure out the mom. So, Brett has a new bottle calf. Here is the little sweetie. 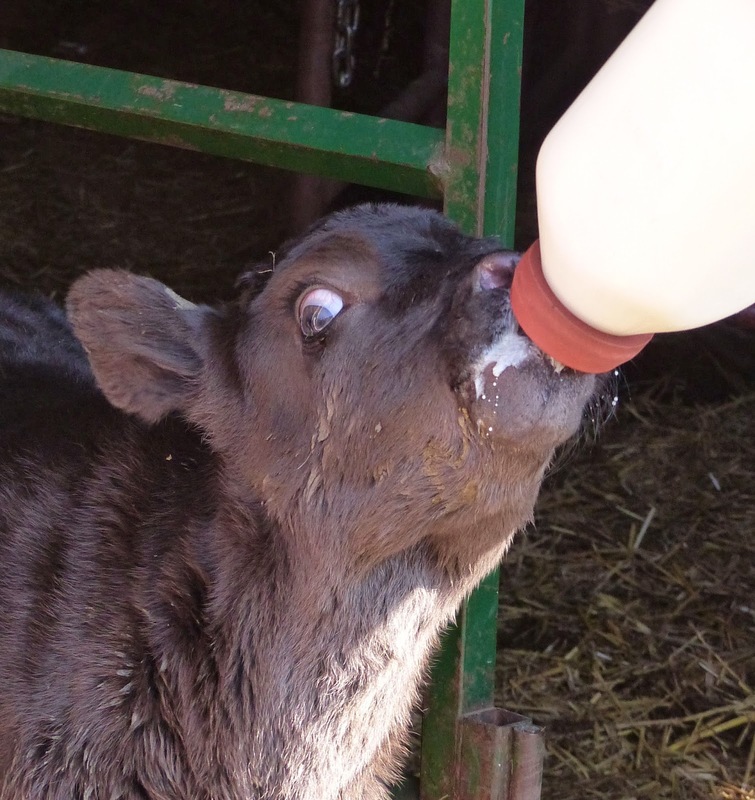 When Brett is going into the barn, this little guy starts moo-ing for his bottle! It is so excited that it doesn't even want to quit sucking to breath!! Here Brett is feeding his little buddy. The calf drinks so fast that some of the milk runs out. Fluffy, the cat, has figured this out so is always nearby for a little snack! Well it has been an exciting night here. On my usual 3 AM check I found a cow in labor. I go back to the house and wait for about an hour as I know it will take her a while yet. I went out later and she had made no progress. I call Brett (son) to come help me get her into the big, red barn. In the meantime I try to get her to stand up. She couldn't stand - at least not for long. Her back end is weak. So, Brett brings the equipment down to the pole barn so we can pull the calf there. I call Christopher (other son, owner of cow) to come out to the farm - and warn him that we might need the pickup and stock trailer. Brett does an internal check of the cow. Bad news, the calf is backwards (coming tail first, legs down). Call Mark (hubby) to come and help. (I have a love/hate relationship with my cell phone currently it is love.) Good news, just as Christopher shows up, Brett got the cow up and she walked! The 'boys' got her up to the red barn and I carried the puller, etc. back up there. All four humans gather in the barn. The cow is in a small pen with a head gate to hold her in one spot. Brett puts on fresh OB gloves (shoulder length) and goes in for another check and explains to us what he feels. Oh no, the cow sits down (like a dog). Christopher releases her from the head gate and she rolls onto her side. This is not ideal for assisting with delivery. After both Brett and Mark try to get the calf turned enough to get the legs back, they give up. (Note, they are attempting to work inside of the cow while she is have contractions.) Christopher takes his cow to the veterinarian in Minot (about 45 miles away). We don't know if the vet will be able to pull the calf out or if she will have to do a c-section. It is now 5:30 AM. Brett takes the 4-wheeler up to check cows again. It has only been a little over an hour since I was up there to check them. He comes back home to get me and our calf sled. There is one new calf and another should be born when we get back up there. Sure enough. We now have two fresh calves and cows to get back to the red barn. We leave the newest calf for last so mom has time to clean and get to know it. Brett gets the calf into the sled (large version of the sleds kids have). We bring the pair back to the barn. Brett puts the calf into the calf warmer. This is a special space with a heater in it. We want to warm the calf up so it doesn't get sick or freeze it's ears off. We go back up to get the other pair and bring them back to the barn. It is now 6:40 AM. We are chilled and wide awake. It is common that we have to sit up for a while after being out at night. So, now we watch a bit of TV, play on the computer or just curl up in a blanket - and wait for Christopher to get home with a report on his cow and calf. 7:40 AM - Christopher just returned home from the vet. Sadly, the calf did not survive. The rest of the day will consist of continuing to check cattle and trying to get a few minutes for a nap! Calving season has begun at Rockeman Herefords. As of this morning we have 10 calves - only 310 or so to go! As I have stated on here before, I have the night shift. For the 30 years that Mark & I have been married it has been my shift. I go out around 3 AM to check the herd. My three guys check the rest of the time (I do help sometimes). We are not strict with this schedule - sometimes it is worse. For example, we had a few nights this week when the overnight temperature was 15 below or colder AND windy. Those nights we checked every hour or two. Newborn calves could freeze their ears and lose them - or worse, freeze their hooves and never be able to walk - or even worse, freeze to death. 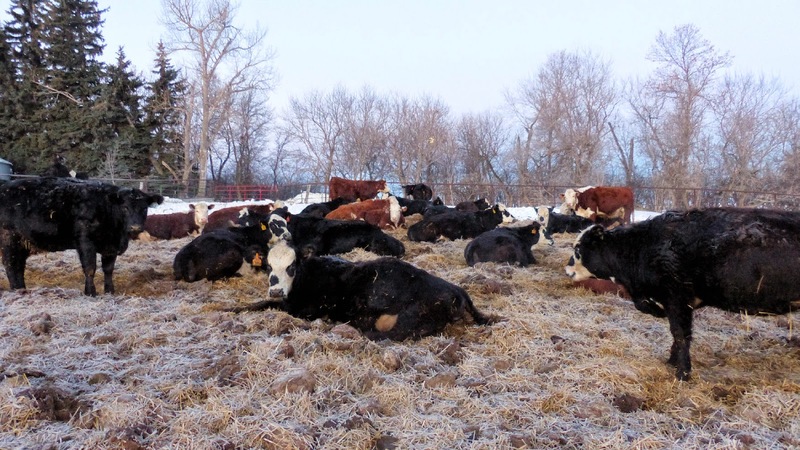 Another reason we need to check on the herd throughout the day and night is to make sure none of the females are having trouble with their delivery. There are times when the rancher(s) need to assist with the delivery or have a veterinarian help. As you can see, calving season is a full time job (24/7) for everyone here. This morning I happened to also take the 7 AM check. The sun was just coming up. 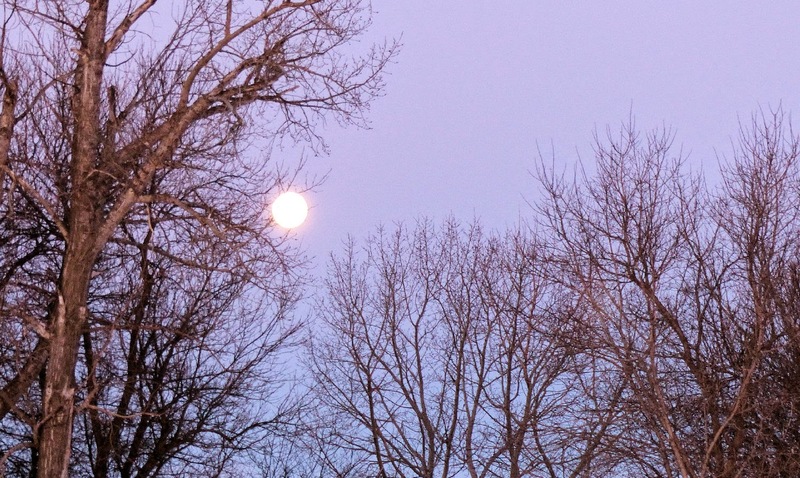 The moon just going down. I just had to grab my camera. Some of the cattle enjoying the sunshine. 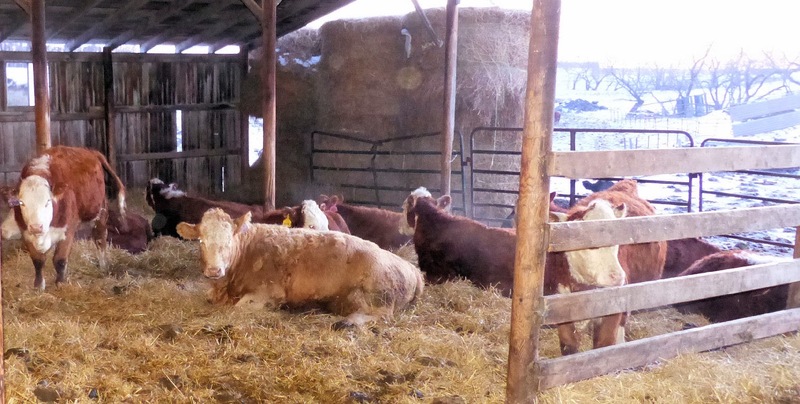 The cattle can also go into a barn. As I was checking the cattle on the hillside, I could hear a soft moo-ing sound coming from the barn. I was certain I would find a newborn calf in there - or a female calving. Sure enough, I looked around the corner into the barn and I found this. There were other moms-to-be in the barn too. No more babies, so back to the house I can go. We will move the new pair up to another barn to be with other new moms and calves. We like to get them in where we can watch them closer and they will be warmer. We feel it is important to watch them closer when it is their first calf (that is who is calving now at our place). We need to make sure the calf is being mothered (loved by mom) and gets that colostrum (first milk with the extra antibodies). Later we will give each calf it's name - an ear tag with it's individual number. I have written about the various jobs we do after a calf is born including record keeping, weighing and tagging. We are part of a new church plant. It is exciting. It is scary. It is a lot of work. We have always attended a very traditional church in our small town. Sadly, due to lack of attendance and money, that church closed this past spring. Our new church is very slowly getting going and we do church different! We don't have a building to meet in so we currently meet in a local pub (it is closed when we meet on Sunday mornings). We have evening Bible Study once a week at a newly opened coffee shop named Gathering Grounds (seems appropriate, doesn't it?). We have been doing various community things too. Some of the things we have done is to pick up garbage in our new town and in the little town we used to meet at. We have participated in a local BBQ Ribfest (contest) and donated the proceeds to a local fellow fighting cancer. Currently, we are working on hosting a community Thanksgiving meal. We are planning to feed about 300 people a complimentary, traditional Thanksgiving meal. It is fun to be part of these adventures. We have a little something for folks to eat and drink before we start our morning worship service. This week was our family's turn to host. I received a number of compliments for this so thought I would share it with you. Put one tube of crescent rolls on bottom of 9"X13" pan. 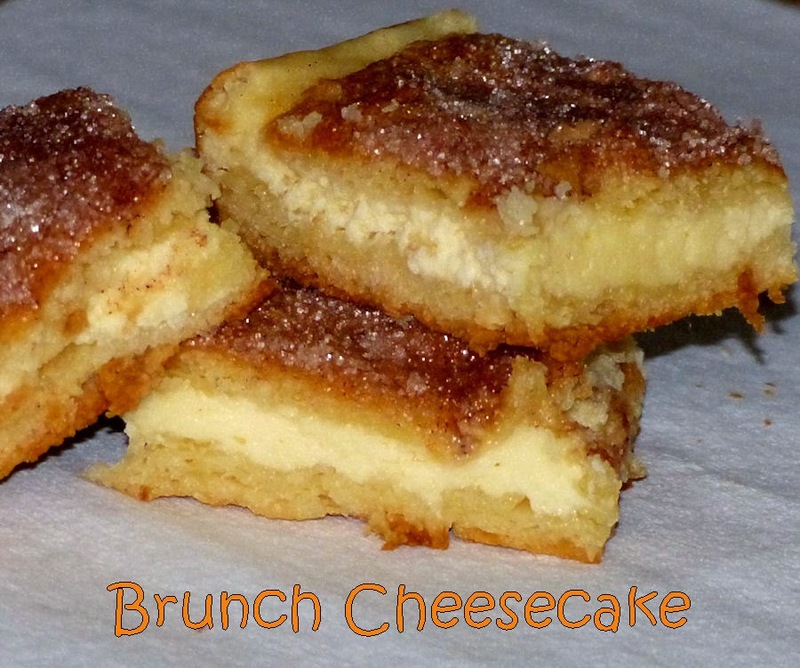 Mix cheese, egg and sugar together well. Spread in pan. Top with other tube of rolls. Top with cinnamon and sugar. Bake for 30 minutes at 350 degrees. I think it is best served warm, but it isn't bad when chilled either! We had some timely rains and temperatures were cool when the crops were flowering (that helps with the yield). So, the crops look pretty good. Because of the cooler temps it has taken longer to get things to ripen and dry in order to harvest. Patience. We were finally able to get into the field. We had about 200 acres of Yellow Peas to combine. Ours ran about average while our son's ran better. Guys got that all done. They moved on to the Winter Wheat. We are shut down now for a few days as we had some more rain. 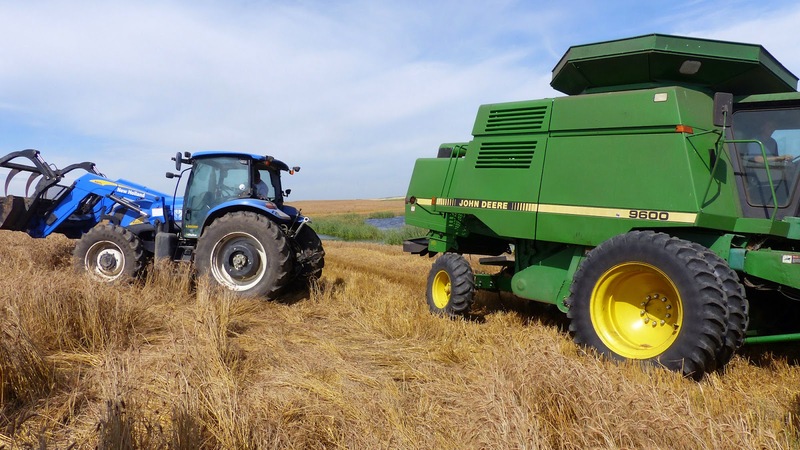 It seems like the Winter Wheat is yielding pretty good but we have heard reports that the elevators don't even want to take it due to very poor quality. I have not taken a sample of ours to the elevator to see how ours is. The elevator (local business used to market our crop) has special equipment to test the quality of the grain. Brett can see that there are some kernels with a bit of mold (Vomitoxin and Egret) which hurts the cash value of the crop considerably. Another problem we have had concern about is the water. Some of our sloughs (wet areas) have grown over the summer. Usually they dry up and we then hay them in the fall. Yes, we had quite a bit of rain this year. Many of the rural roads are in poor condition due to so much water along them for so long - that softens the road bed. 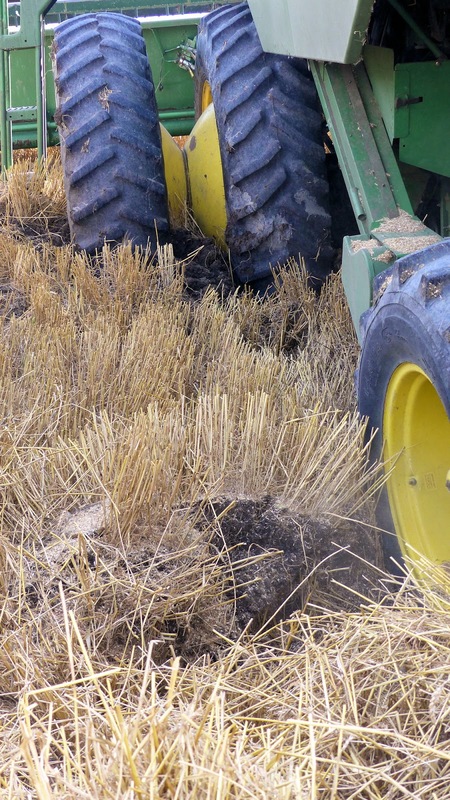 There are concerns of how to get our equipment to fields and the crop hauled out of the fields. 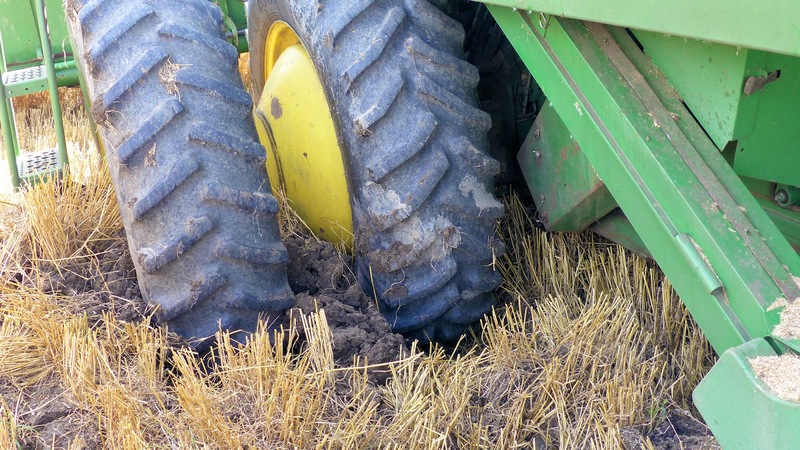 We found out just how wet one field was when the combine got stuck. 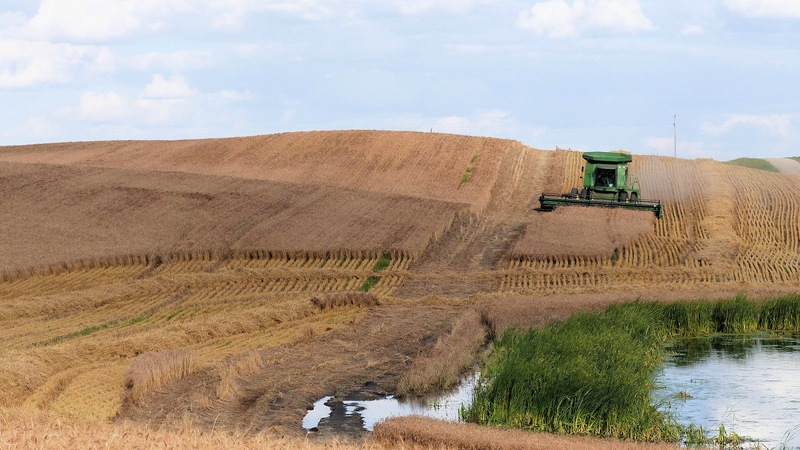 The operator was working his way back to the trucks to unload the hopper (location on combine to store grain) when he got too close to the edge of a slough. The water had come up so far that you can't even see the edge as the wheat is standing in water. A couple of looks at the tires in mud. It doesn't look too bad. However, when you realize that there is about 15,000 pounds (abt 250 bushels) of Winter Wheat in the hopper and, since this was on a side hill, that had slid down to the lower side, we have a problem. So, we got a truck to back up alongside the back of the combine. We could then unload some of the grain from the hopper. 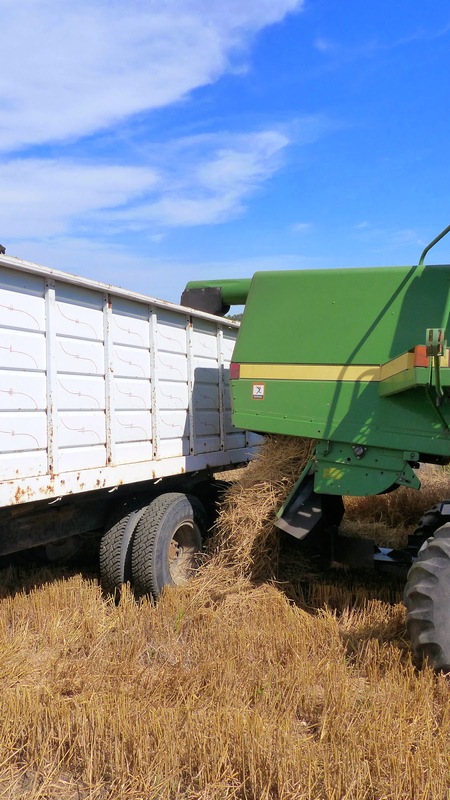 After doing this twice, we were able to pull the combine out using one of our tractors. And it was back to harvesting - after eating our dinner which was now cold! We finished that field and moved on to the next one. The day ended with a break down on the combine and more rain. Mark & I have been married for 30 years and have two grown sons. We are happy that our sons have joined our business so we/they can keep it going for a 4th generation. All rights reserved. No part of this blog (including photographs) may be reproduced without permission.